Innovations on the Road: 80,000 Visitors. 40,000 Kilometres. One Message. Ever notice those massive transport trucks that pass you on the highway, usually shipping goods, such as food, fuel, or heavy equipment? This is a story about an altogether different kind of truck. This is the story of Together: An Exhibition on Global Development, an innovative form of travelling exhibition. Together is an interactive experience for all ages, stimulating conversation about Canada';s role in reducing global poverty. In a cleverly designed truck that expands out to 1,000 square feet (93 square metres) of exhibition space, Together welcomed 80,000 visitors, across 57 communities, in ten provinces and territories from 2015 to 2017. Its 53-foot (16 metres) tractor-trailer did not merely transport the exhibition; it was the exhibition, designed to meet diverse audiences where they were, whether at a high school, a farmers market, or a cultural festival. 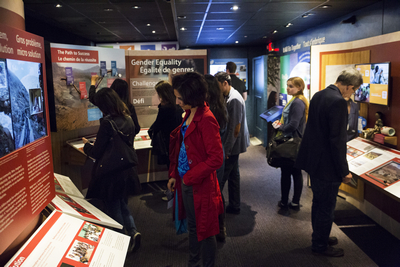 In this way, Together overcame many of the common challenges faced by conventional travelling exhibitions, such as transportation and installation, and offered a unique opportunity to engage audiences across Canada and inspire visitors to take action on global issues. In partnership with Global Affairs Canada, Together was developed by Aga Khan Foundation Canada (AKFC), a non-profit international development organisation that, for over 35 years, has worked across Africa and Asia to reduce poverty and improve quality of life in some of the worldrs"s most difficult environments. group of agencies invests more than $750 million annually to address the social, economic, and cultural dimensions of development. In Canada, AKFC has a mandate to strengthen understanding, knowledge, and support for global development. With Together, AKFC looked to build on its longstanding public engagement experience to develop a new exhibition that would explore the role that Canada, and Canadians, play in sparking positive global change ndash; and inspire visitors to take action on world issues. The exhibition-in-a-truck model provided that opportunity. Bringing the exhibition to life required global teamwork and participation: from the financial support of Global Affairs Canada; to field staff who collected childrenrs"s educational toys in Uganda to display in the truck; to over 20 Canadian development organisations, such as UNICEF, Red Cross, and Save the Children, that shared examples of how many different Canadian organisations are contributing to global development and poverty reduction. When visitors walked into the Together exhibition, they were transported around the world. They heard and saw stories of women and men who are working to create positive, lasting change in their communities ndash; and met Canadians who are supporting those efforts. Using clear, concise, and accessible language in English and French, Together introduced visitors to some of the most pressing development challenges-food insecurity, gender inequality, lack of access to health care and educationmdash;then allowed them to explore solutions to those challenges. 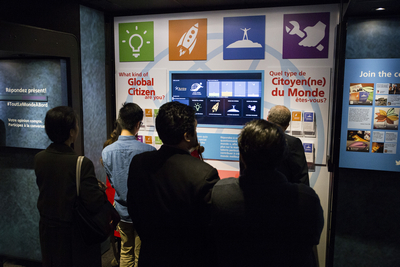 In the "Take Action" section of the exhibition, visitors were invited to take the Global Citizen quiz to discover what kind of global citizen they are- Thoughtful, Hands-on, Start-up, or Dream-big Citizen- and how they could use their special skills and talents to make a difference. Over 16,000 visitors took the quiz, 20 percent of overall attendance, and were then given specific calls to action based on their citizen type. While the primary format for the exhibition was self-guided, additional programming provided tailored opportunities for deeper engagement with key audiences. The programming included an art contest, a social influencer tour, school-based activities, tours and resources, and events. The exhibition travelled to a diverse set of venues: festivals, powwows, farmers markets, schools, universities, colleges, malls, libraries, community centres, and museums. The ability of the exhibition to access both rural communities and urban centres enabled AKFC to meet its goal of reaching new, wider, and more diverse audiences than it had done with its previous, conventional travelling exhibitions. During the first year of touring in 2015mdash;in which Together reached 15,000 people in five provincesmdash;AKFC implemented a robust evaluation plan to determine what was working, and what needed to be changed to ensure impact and a successful visitor experience. Key sources of data were focus groups, case studies, and visitor observation reports filed by the tour manager or staff for each stop on the tour. Evaluations from 2015-2016 showed that 93% of visitors indicated that their knowledge of global development had increased and that they wanted to learn more about global development, but that they also wanted to see themselves reflected more in the exhibition. Visitors wanted more opportunities to include their aspirations for a better world in the exhibition and connect with like-minded people on these important issues. In response to that feedback, AKFC developed an art competition for the 2016 and 2017 tours and invited Canadians to submit a piece of artwork that reflected why they care about global development. The Foundation received close to 100 submissions from across the country and 20,000 votes from the public. Each year, the top three artists - as selected by online voting and a jury - had their artwork featured in the exhibition as it toured across Canada, with the first-prize winner attending the formal launch event. In evaluations from 2016, a majority of visitors identified the artwork component of the exhibition as the element they enjoyed most. The listening and evolving approach that underpinned Togetherrs"s evolution remained relevant as the exhibition wrapped up its final tour in December 2017. Having engaged tens of thousands of people over three years, AKFC is now considering Together's longer term impact and legacy. What lessons on innovation can it apply to future exhibition public engagement efforts? Adapt and be nimble: Building on past successes is important, but true innovation requires constant listening and evolving. Exhibition components that did not work well in the first year were adapted or replaced in year two. AKFC adopted a mindset and operational approach of continuous learning, iteration, and improvement, including looking outside the development sector for innovative models and tools for engaging Canadians. Meet people where they are: Together did this in two powerful ways. Its mobility allowed AKFC to reach smaller, rural communities in addition to audiences in Canada's major urban centres. Careful venue selection also enabled audiences to more easily connect the global content within the exhibition to local issues and concerns. Think through ladders of engagement: Visitors entered and left the exhibition with very different levels of understanding of and interest in global development. It is therefore important to provide audiences with a range of clear paths, steps, and actions to become more engaged global citizens. From the Global Citizen action cards to additional programming, such as the educator curriculum guide, each step of engagement is customised for specific audiences. Together offers a unique case study on pushing the boundaries of travelling exhibitions models. Its mobilitymdash;paired with its compelling content, immersive, interactive experiences, and complementary programmingmdash;made it an innovative form of public engagement and visitor experience on important global issues that affect us all.